If you’ve tried almost all acne products, but can’t seem to find one that truly works, then you probably haven’t fully considered all your options yet. Aside from face washes and scrubs, there are also acne soaps that can effectively control and prevent your breakouts. While soap and water may be enough to thoroughly cleanse your face, not all kinds of soap can fit this equation. To help you understand the concept better, here are the 5 best soaps for acne we think will work for you. 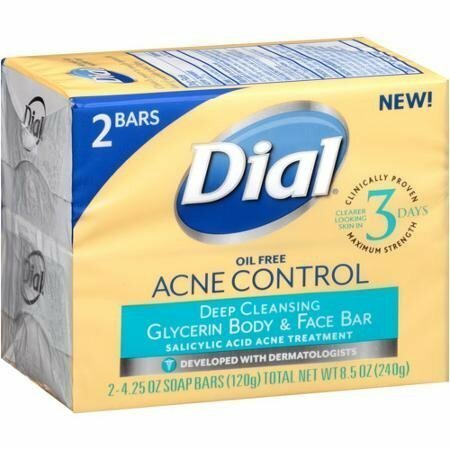 Dial Acne Control Deep Cleansing Glycerin Body and Face Bar contains both salicylic acid and glycerin to treat your acne while making sure your skin stays moisturized. The product has been proven to help you get clearer skin in just 3 days. 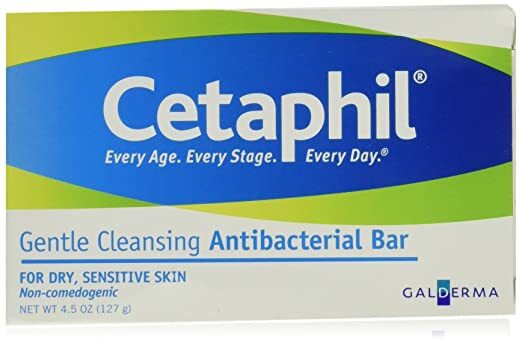 Compared with the other product, Cetaphil﻿ Antibacterial Cleansing Bar has 0.3% Triclosan content. Although helpful in killing bacteria, some people find it concerning as Triclosan has been linked to a few health issues. The product, however, is good to use if you have sensitive skin. Users with varying skin conditions, such as rosacea, have been using the bar without any irritations. 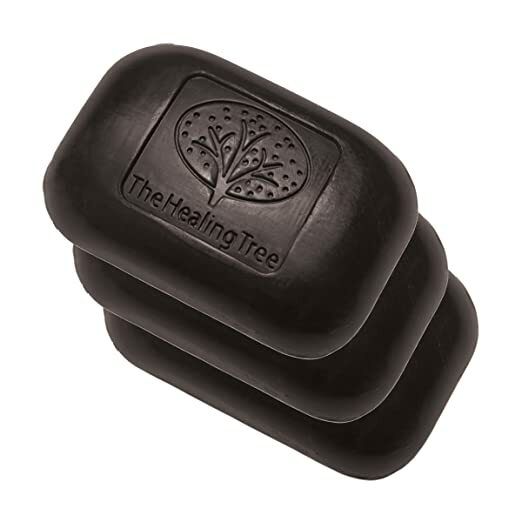 If you are looking for an all-natural product, then we can definitely recommend Bamboo Charcoal Soap by The Healing Tree. It has bamboo charcoal that is useful in drawing out impurities and toxins clogging your pores. However, because it is made of charcoal, you should be cautious in using the product on tubs and white tiles as it can be a bit messy to clean after use. Braunfels﻿ Labs Premium 10% Sulfur Advanced Wash has a vegan formulation. It’s free from fragrances that can potentially irritate your skin. Although it doesn’t contain artificial fragrances, the scent of sulfur can be a major deal breaker. Similar to Adovia soap, Grisi Sulfur Soap with Lanolin for Acne also has sulfur. What we like about the product is that it also has lanolin to counter sulfur's drying effect. This, however, isn't a complete guarantee that it will not dry out your skin. This product is a maximum salicylic acid treatment that is clinically proven to give you results in just 3 days. Aside from your face, you can also use it to address those stubborn chest and back acne. Users like that aside from its antibacterial property, this bar can also moisturize the skin because of its glycerin content. They also love how pleasant it smells. The product can give a long-lasting deodorant protection. A lot of users claim that it keeps them smelling fresh all day. It lathers up nicely, but a few people find that it doesn’t last that long. Some even think that it’s smaller than the average soaps. One thing that you may not like about the product is that it tends to leave a waxy film on the skin. For some users, its scent can be a bit overpowering. Cetaphil Antibacterial Cleansing Bar has a mild, non-soap formula. It has a 0.3% Triclosan to kill away acne-causing bacteria. This low concentration of Triclosan renders bacteria unable to utilize fatty acids. As a result, bacteria are left to starve to death. Aside from its antibacterial property, this bar can also remove excess sweat and oil without leaving the skin dry and irritated. It even has a moisturizing property. Users like that it actually works as it has effectively prevented their everyday acne. Even people with PCOS and erratic hormones use it. The product also isn’t heavily scented, which we actually like. If you have the sensitive skin type, we recommend trying this product out. In contrast, however, there are people who are wary of using the product because of its Triclosan content. Recent researches tell that it can be damaging to the immune system and can cause bacterial resistance. This product was specially formulated to draw out toxins and eliminate the excess oil and dead skin cells clogging your pores. It’s made from natural ingredients and claims to be hypoallergenic and cruelty-free. What we particularly liked with this product is that it can help clear out your problematic skin in just 1 month. We also liked that it doesn’t contain fillers or even fragrances. Because it can unclog your pores, this soap isn’t only good at addressing existing acne. In fact, it’s also effective in clearing out blackheads and preventing future breakouts. Users, on the other hand, are fond of the fact that it doesn’t leave any greasy feeling after use. You should, however, remember that the product rinses in black color. A few people find the staining it creates on tubs annoying. They dislike the mess they have to clean after using the product. Braunfels Labs Premium 10% Sulfur Advanced Wash contains plant-based ingredients and has a vegan formulation. It’s free from fragrances which makes it even good for acne prone skin. ​The product lathers well and help dries out pimples fast. After use, you’ll feel your skin tighter. This effect shouldn’t cause you any concern- unless it’s accompanied by a burning sensation, severe itching and intense redness (a.k.a allergies). ​If this is your first time to use a sulfur soap, I suggest you start off with once a day, preferably at night. ​Take note that this product has a drying effect. If you already have dry skin, this can make things worse for you. 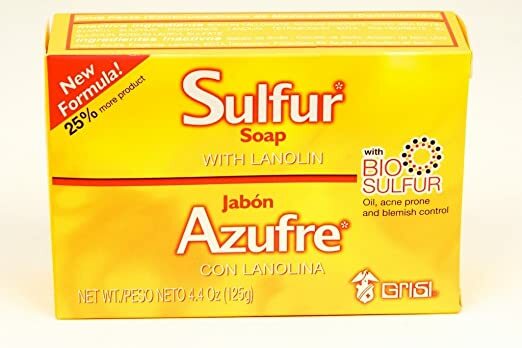 Grisi Sulfur Soap with Lanolin for Acne is another product that contains sulfur. It is formulated to target both pore and acne concerns. Aside from sulfur, the product also has lanolin to counter the soap’s drying effect. As for effects, users were able to see their acne drying up in just a matter of days of using the product. They also liked that it didn’t cause any redness or irritation. Because it does contain sulfur, you should expect the product to smell a bit. If you have a highly sensitive sense of smell, like some of the product users, this can be a major deal breaker. For some people, the soap’s lanolin content isn’t enough to moisturize their skin. They still complain about how dry their skin becomes after using the product. Using soap to address your skin issues can be a wise move, particularly if you’re on a budget. Unfortunately, not all kinds of soap can work for your acne. Regular soap may not thoroughly cleanse your skin. Because clogged pores generally result in inflammation and acne, you’d want to use soap that can effectively remove dirt and excess oil. Some regular soaps can be too harsh for your skin and cause allergies. The right soap should be hypoallergenic and non-comedogenic. They can make your skin dry. Regular soaps may not have the right kind of moisturizing ingredients to nourish your skin. Most of them are seldom dermatologist recommended which means that it’s possible that they aren’t tested for their adverse reactions. Regular soaps create big bubbles which can force the soap into your pores. When this happens, it narrows down your pores and traps the sebum inside. The right acne soap should only make a creamy lather and very small bubbles. When using an acne soap, it’s best if you can work it into a lather first before applying on your face. Once applied, make sure to allow the product to work at least 15 to 30 seconds before rinsing off. Ideally, you should not scrub your face too hard when using your soap. You should also skip using a washcloth to rub it in. There shouldn’t be any flaking or scaling of the skin. If you see any of these effects, then there’s a good chance that the soap you used has alcohol and other harsh ingredients. There also shouldn’t be any redness or irritation as it can signal a break in your skin’s barrier. Excessive tightness is also an indication that you’re using the wrong product. You can assess for this at least 5 minutes after drying your skin. Small bumps and hives can signal an allergic reaction to any of the product’s ingredients. If the reaction is too strong, make sure to seek medical help right away. The best soap for acne shouldn’t only be able to address your existing acne, but it should also be able to prevent the factors that can trigger them in the first place. Because of this, we’re placing Bamboo Charcoal Soap by The Healing Tree on our top spot. We particularly like that the product has all-natural ingredients. We also like its bamboo charcoal content despite it making the product a bit messy to rinse. Because it can help draw out impurities and excess oil clogging your skin, this product can also prevent blackheads as long as you keep using it as part of your daily skincare routine. Using a soap can dry out your skin. Make sure you apply a moisturizer that’s fit for your skin type to help re-establish your skin’s balance.